Properties for sale in Brittany, France - AHIB-AKH-GERS Ponsan-Soubiran, Gers 32300 4 bedroomed 16th Century Farmhouse with barn, art studio, pool and charming grounds of over half an acre. AHIB-AKH-GERS Ponsan-Soubiran, Gers 32300 4 bedroomed 16th Century Farmhouse with barn, art studio, pool and charming grounds of over half an acre. 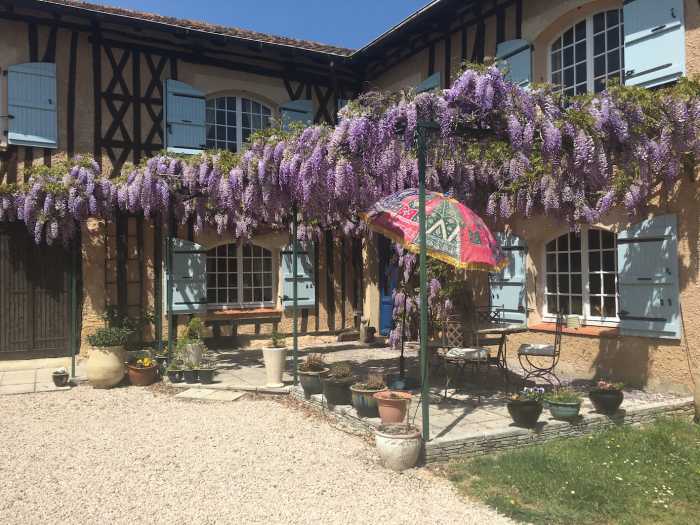 A splendid 16th Century timber framed Gascony farmhouse with outdoor swimming pool with pool cover, workshop and garaging for several cars on enclosed/gated grounds of 2,500m2. The 4 bedroomed (master with en-suite), 3 bathroom house has been sympathetically restored creating a charming and very comfortable home retaining many of its original features. In a quiet and secluded, but not isolated, situation on high ground with beautiful views of the Pyrenees and surrounding countryside. Situated in the Gers department in the Midi Pyrenees between two villages. Skiing and the Spanish border just 1.5 hours away. Toulouse: 1.15 minutes. Tarbes : 45. Pau:55 minutes and Biarritz: 90 minutes. Accommodation (330m2): Ground floor: Fitted and equipped kitchen (4.6 x 4.2m) open onto dining room (4.8 x 3.5m), second sitting room/bedroom (5.8 x 4.7m), large utility room and cave, WC and wash hand basin. First floor: principal sitting room (11 x 8.4m) with large balcony to the south with panoramic views of the Pyrenees, bedroom 1, bedroom 2, bedroom 3, bedroom 4, main bathroom with a bath, bidet, WC, massage bench, large shower with a hydro massage unit, small bathroom with bidet, wash hand basin and shower. Garden and outbuildings: The grounds of 2500m2 are nicely planted with shrubs and plants including a small kitchen garden with fruit trees and vines. A covered salt water 12 x 6m swimming pool. Garaging for several cars, workshop and potential for a gite… the outside barn has been converted into a large art gallery with studio which stands alone. This has the further potential of being converted into a separate apartment. There is external parking for two cars below the outside barn and below the large salon parking for cars workshops and storage. Oil/Wood heating. Central and log burners. Charming and luxurious 16th Century Farmhouse a classic example of local architecture with pool and open views over surrounding countryside. This house oozes appeal and comfort… a lovely timbered property with shuttered windows, walled garden, terraces, pool and wonderful views. This property is in the wonderful department of the Gers in the Occitanie region of south west France (Gers is one of the seven departments that made up the former Midi-Pyrénées region in southern France). • Outdoor eating areas by the pool and courtyard ideal for breakfasts and evening meals. distance from a full range of activities from skiing and rafting to historic towns. de Compostela to the resistance movements of the Spanish Civil War and Second World War. The Pyrenees are home to miles of hiking trails, spectacular views and an amazing variety of flora and fauna - from eagles and kites to marmots, wild boar and even the occasional bear! Swap rush hour for star-filled nights and fresh air! Gers is one of France's sunniest departments, with long, pleasant summers. Nearby Auch is one of the warmest towns in France with more than 300 sunny days in a year. Temperatures in summer peak in the high 30's - excellent weather for lazing by the pool. In winter, temperatures drop providing excellent skiing and snow-shoeing conditions in the nearby Pyrenees from New Year until April.